20 Feb 2013: I'm always happy to see this idea of Solar Earth Charging being taken up by others, although I am happier if they don't claim to be 'The First'. 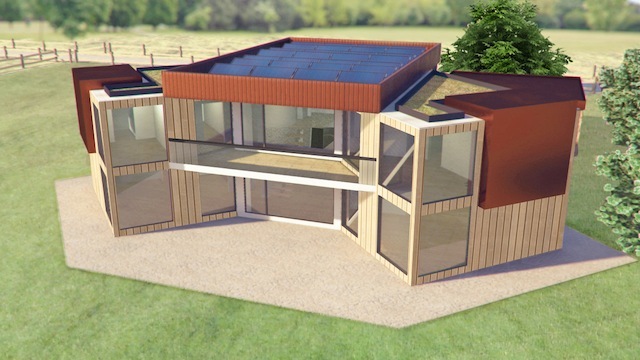 Unless shown otherwise, the Peveril Solar House is the first single house in the UK to be entirely solar heated all year round (including hot water), using energy storage. It takes two summers minimum (collecting heat) and a couple of winters (using the heat) to be sure if it has worked, and we reached that target in mid 2011. Caplin Homes (Leicester) have a press launch on Monday 25th Feb (email me for details if you read this before the 25th) - a new house due to start this month which will use the technology of Solar Earth Charging, using Newform's PVT panels. 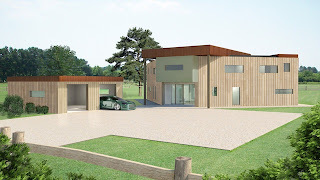 I am delighted to see another house of this type and envy them the chance to do it as New Build project. Images below by architect John Cotterill. It's quite odd that the PVT panels are entirely concealed behind a parapet. I know the Peveril Solar house looks a bit 'crowded' with panels, but this is necessary because it is a retrofit, and we don't have any choice but to use the roof we have - I don't feel ashamed of having this look, even though one of my friends once wrote on Facebook "Is there a house under there, David?" The most interesting part of this is that the ground loop is not actually using the large area of site around the house, but using a 2D grid of short vertical pipes below the footprint of the house, using the same idea as Dr Chris Wood and Roger Bullivant's 'Energy Foundations'. If you have a chance to start again with a new-build, this is a very good idea, providing you are aware of the risks of seasonal thermal expansion or contraction of the ground below (and how this might affect the slab above). I designed houses and flats using Chris's idea about two years ago, but this didn't get further as the developer seemed more keen on selling on the land than actually building the buildings!